Forgo your traditional peeler for this fun kitchen addition. VEGGIE LOVE: Who knew, you can promote a more peaceful world while making a salad. 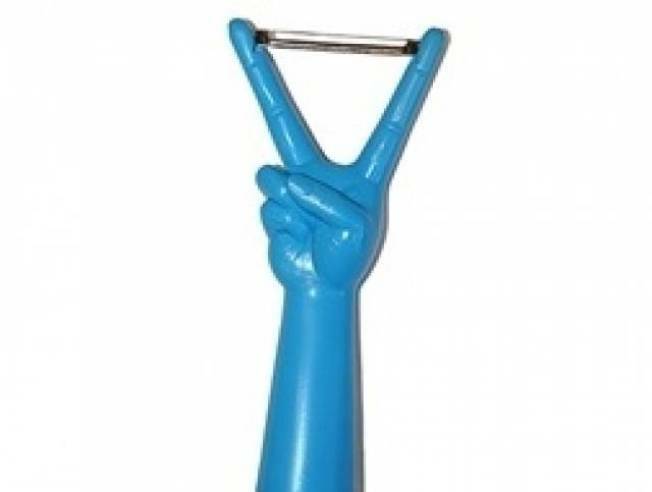 Peel carrots, slice potatoes and more while entertaining yourself (and/or guests) with the Peace Sign Veggie Peeler. Available at Art Effect; 934 W Armitage Ave; 773.929.3600 oronline. SIMPLY GORGEOUS: Applying makeup can be quite the chore, but Trish McEvoy simplifies the process with her new Portable Beauty Simplicity Collection. Travel anywhere, challenge any climate, and still put on a perfect face, pronto. Try the Portable Beauty Brush set, a pack of four handcrafted brushes in a wallet-sized, quilted pink case. Get it at Bluemercury. SO SPICY: Get over the fact that summer is over and get in the fall spirit at the Philosophy Holiday Preview Party. Reaquaint your senses with those beloved holiday scents (Pumpkin Spice, Eggnog, Gingerbread) in the form of Philosophy's coveted bath products. Friday, Oct 2, 11a.m.-6 p.m. at Nordstrom Woodfield Shopping Center. Call (847) 605-2121 and ask for the Philosophy counter to book your appointment.